The San Diego Zoo is hands down one of the best and most exciting attractions in the city, for adults and children alike. Over 4,000 animals from over 800 species all live in this 100 acre zoo, from monkeys to pandas to tigers. The zoo is split up into 9 different zones, which makes it easier to navigate and find your favorite exhibits. The zones are: Polar Rim, Panda Canyon, Asian Passage, Lost Forest, Discovery Outpost, Outback, Urban Jungle, Africa Rocks, and the Elephant Odyssey. 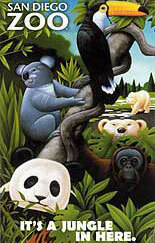 Purchase Discount San Diego Zoo Tickets. Or add on to the fun by purchasing the San Diego Zoo and Old Town Trolley Package. Aside from the natural habitat exhibits where all of the animals live, there are also plenty of ways to keep busy and entertained within the San Diego Zoo. On the weekends at various times throughout the day you can catch a showing of Dr. Zoolittle Children’s Show, featuring some unbelievable animals and magic. Camp Critters is another popular performance on every day in the zoo, featuring tons of varying animals and requiring lots of audience participation. Children in particular really love this show. There are plenty of great restaurants found in the zoo, from casual dining suitable for the whole family to upscale dining overlooking a waterfall. Because of the vast size of the San Diego Zoo, it is recommended that you take the guided tour by bus as soon as your arrive. The 35 minute tour is completely narrated, and gives you a quick overview of the zoo, the best places to see certain animals, and feeding times at certain exhibits. You will also get a peek at many of the most popular animals. It is best to take this tour in the morning, when the animals are generally most active. Explore all that America’s Finest City has to offer while enjoying the lowest prices!